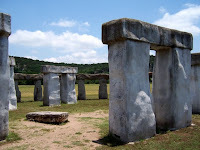 Post Cards From the Past: Stonehenge at Hunt, Texas, One of Two. 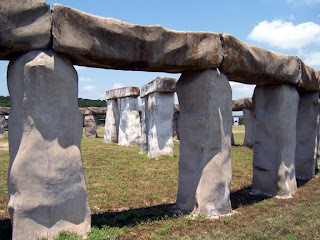 Stonehenge at Hunt, Texas, One of Two. 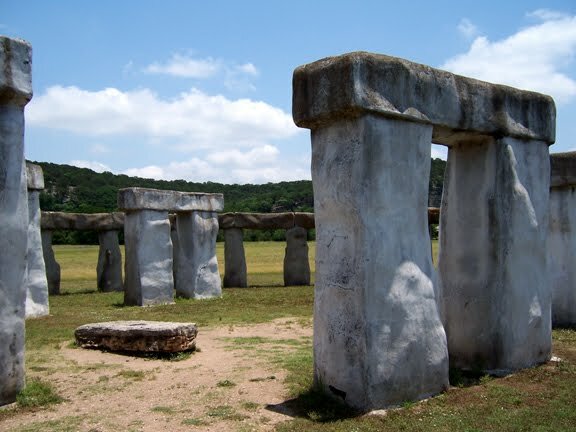 About a year ago the Celtic Myth Pod Show ( www.celticmythpodshow.com) had a blurb on the two replicas of Stonehenge that had been built in Texas. One I knew, the one in Odessa, but it is far from my home in Georgetown. It would be like driving from Paris to Berlin. However, I was not aware of the other one, located in Hunt, Texas, less than one-hundred miles away. The morning was bright and my wife was willing (you have to act on those moments). We headed across the winding highways through Texas Hill Country. An unexpected bonus was Texas peaches. The harvest was in and we stopped at a roadside stand to buy a basket. Impetuously, I grabbed a peach and chomped into it as soon as we were back on the road. The peaches are small and oh so sweet, but a word of caution. Driving and Texas peaches do not mix. The nectar runs down your cheeks, covers your hands, and gets the steering wheel sticky. It was about a two-hour ride when we arrived at Hunt. It is small burg consisting of a gas station and restaurant. We found the “turn off” and headed west. We thought there would be sign of some sort to direct us. If there was, we did not see it. Just when we were thinking that we would never find the thing, presto, there it was. Just like the one in Salisbury, close to the highway, nestled on a vast misty plain. It is not a replica of the real Stonehenge, but more of an emulation of what the original structure might have looked like about 1500 BC. It was commissioned by Al Shepperd and built by Doug Hill in 1989 and only took about nine months to complete. The one in Salisbury was erected in phases over the course of five-hundred years or more. The stones of this structure are about two-thirds the size of the original and only approximately the same shapes, not duplicates. The Original Stonehenge is an ancient ruin of eroded and fallen megaliths. This adds to its mystique and makes for wonderful photos, but it hard to visualize how it might have been. In this one, when you stand surrounded by the inner ring of giant blue stones, and outer ring of sarsen stones, you feel the temple-like quality and grandeur of the original one. Perhaps you can catch a wisp of what motivated those Neolithic tribes to drag stones that weighed so many tons such great distances. The outer ring of the Salisbury stones were transported about twenty miles and the huge blue stones used in the inner ring were transported over two-hundred and forty miles. 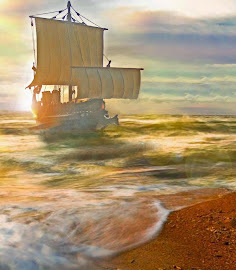 These were stoneage people. I do not even think they had the invention of the wheel to help them. I guess Al and Doug had more time and money than they knew what to do with to build something like this. If you are in the area, it is an attraction worth seeing. Did I mention it is free? There is only a small box asking for modest donations to help maintain the site.